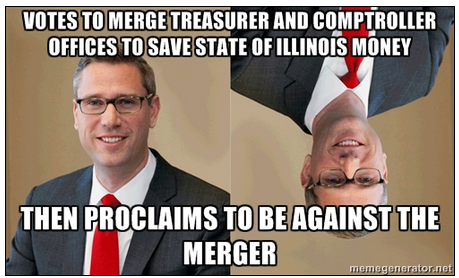 During an interview on WBBM’s “At Issue”, Frerichs opposed merging the offices of state comptroller and treasurer, even though it would save taxpayer’s over $12 million annually. Even more bizarre, Frerichs had voted for the merger in the past and even bragged about supporting it a few months ago. Mike Frerichs’ new-found opposition to streamlining these offices reveals a troubling lack of consistency and fortitude, which will cost Illinois taxpayers more despite already being victims of the Quinn/Frerichs tax and spend regime. And...what did his hometown newspaper have to say about this about-face times two?